The envelope felt funny, padded, like it contained a lacy undergarment, or a whoopee cushion, or so I guessed. Though addressed to yours truly, the sender's name was unfamiliar. Inside the packet I found a potholder [see photo above], and the answer. 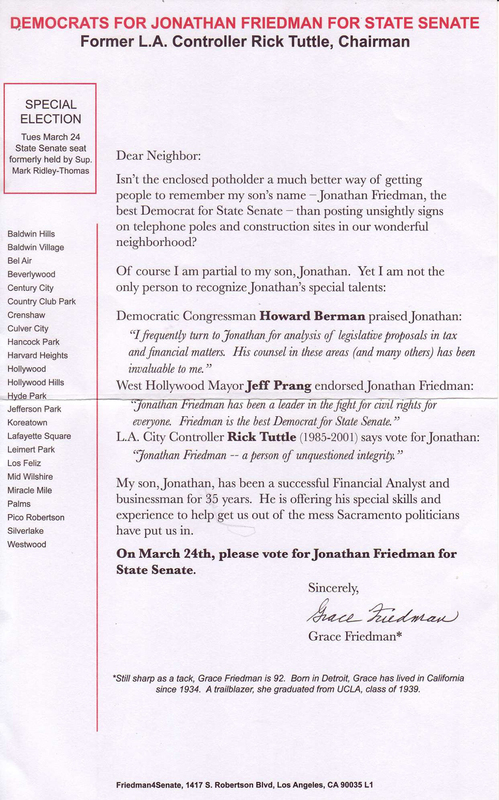 Grace Friedman is the 92-year-old mother of Jonathan Friedman. And, as Jonathan's mom explains in the letter that accompanied the potholder, she wants me to vote for her son in Tuesday's special election. 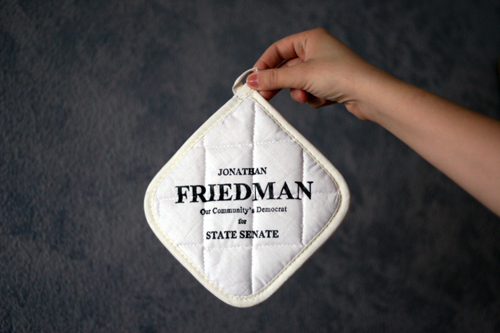 Isn't the enclosed potholder a much better way of getting people to remember my son's name � Jonathan Friedman, the best Democrat for State Senate � than posting unsightly signs on telephone poles and construction sites in our wonderful neighborhood?" As far as political gimmickry goes, this one was good for a grin, and it worked. I fell for it. I'm writing about it. Besides that, we're cooking a lot more meals in the Sullivan family kitchen these days (all of them) and we needed another potholder. So, thanks, I guess, to Jonathan's mom, who, incidentally, was born in my hometown of Detroit. I'm not endorsing anyone in this race, but, well, I'm sure I'll think of her and her son every time I make eggs for at least the next few months.